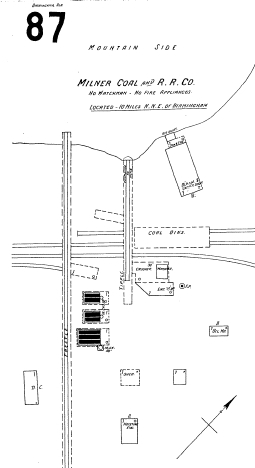 This layout of the Milner Coal and RR Co. mine shows a site with a mine entrance, coal bins, crusher, washer and rail spurs. The Milner Coal and RR Company was established by 1886 with initial capitalization of $200,000, according to Armes, page 339. The location of this mine site is hard to pin down. Based in information gathered, the author Initially thought No. 1 to be at the north end of the Newcastle area, at the end of McCormack Road. Additional study of old maps and terrain on the USGS maps, and the location of the rail spur on the maps indicates to the author that this site is farther south than originally thought. Milner Coal and RR Company operated Mine 1, and by 1908 operated No. 2, No. 3 and No. 4 mines, although No. 1 is not shown in 1908. Later ownership apparently operated a No. 5 and a No. 6 mine as well. See the following pages to learn more about the apparent locations of 6 mine sites at Newcastle.